When I went onto the bathroom I found Mia getting ready to wash her hands. She'd already taken the step stool out of the linen closet and placed it in front of the sink. I was greeted with her smile and "Oh Nana, you have the softest toilet paper in the whole world. I wiped my fannie and it didn't hurt at all." Keeping my laughter and smile to myself, I looked into her big eyes and said, "Would you like to take some home?" "Yes, please," said the little voice. Taking the nine pack out of the linen closet and handing it to her she bagan to poke her little fingers through the wrapper. I said, "Oh, you can have the whole thing. Nana has more downstairs." 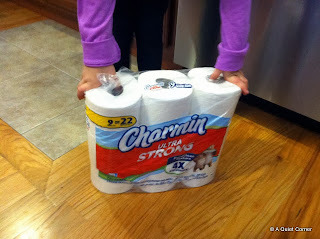 Running out of the bathroom toward the kitchen hugging the nine pack of toilet paper, she exclaimed, "Daddy, Daddy, Nana said I could take all this toilet paper home. I wiped my fannie and it didn't hurt at all. It's so soft Daddy. Wait till you feel it!" They all left smiling and I smiled too. After all, how many children are happy getting toilet paper from their Nana? Makes you wonder what THEY are using. too precious! should be a commercial for them! oh how cute is that. I am lauging. Your Granddaughter may get a commercial yet with you in it Nana.